maggielwalker is a Legacy Library. Legacy libraries are the personal libraries of famous readers, entered by LibraryThing members from the Legacy Libraries group. » Maggie L. Walker 's catalog. » Maggie L. Walker 's legacy profile. maggielwalker is also an author. 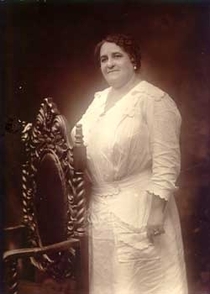 About meMaggie Lena Walker (July 15, 1867(4-7)-December 15, 1934) was an African-American teacher and businesswoman. Walker was the first female bank president of any race to charter a bank in the United States. As a leader, she achieved successes with the vision to make tangible improvements in the way of life for African Americans and women. Disabled by paralysis and limited to a wheelchair later in life, Walker also became an example for people with disabilities. Walker's restored and furnished home in the historic Jackson Ward neighborhood of Richmond, Virginia has been designated a National Historic Site, operated by the National Park Service. and is listed under "Documentary Artifact."